A few weeks ago Hamburg hosted the G20 Summit, welcoming leaders of the world’s biggest economic powers. The city fathers had promised that the summit will have little impact on the daily life of the city. Unsurprisingly, the reality turned out quite different. On the sunny Thursday morning, as I left the house with both kids in tow, it felt like someone had pressed the mute button on our busy street. As we made our way through the streets to a nearby playground we were enveloped in eerie stillness, interrupted only by the sirens of emergency vehicles in the distance and choppers flying overhead. The unnatural quiet remained for the following three days. Many locals had left the city, others (like us) stayed and stocked up on food to make leaving the house unnecessary. Numerous stores boarded up their windows, workplaces remained closed, and the public transport services were erratic. Watching news footage of black-clad rioters burning cars, smashing windows and confronting the police, we felt like in the eye of the storm. The weeks after the summit have brought heated discussions by the bucketful. The political parties are shifting blame back and forth, the police are criticised for everything from too much involvement to too little involvement, whereas the alternative left appears to be in the throes of an identity crisis. But, alongside the bickering, these weeks have also seen the people of Hamburg coming together in unexpected ways. One of the coolest initiatives took place on Sunday, the day after the summit was over. 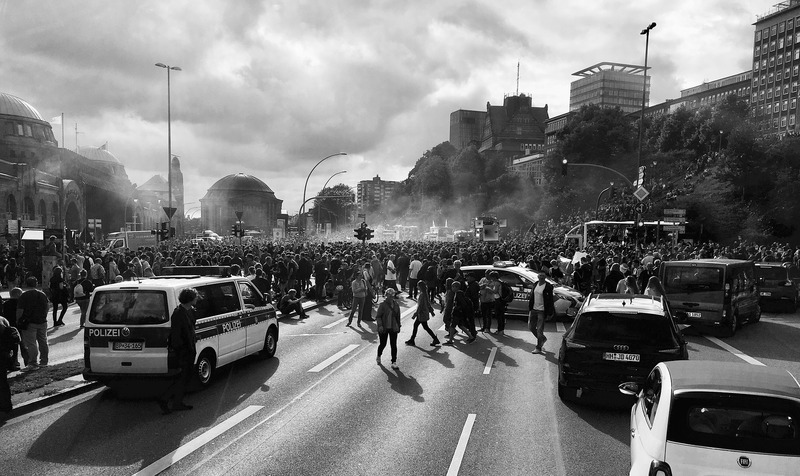 Following a call on Facebook, over 7 000 people participated in Hamburg räumt auf! and cleaned up the districts that had experienced the most vandalism. And it wasn’t only individual volunteers. Hagebau, a chain of construction stores, donated the cleaning supplies. Numerous cafes and restaurants provided everyone with food and drink, and some people were even stopping by with homemade treats for the participants. If the video below is to be believed, the Schanze had never been cleaner! During the G20 Summit, safety and security was ensured by around 20 000 policemen and women from all over Germany and even the neighbouring countries. Almost 500 of them were injured during the demonstrations and confrontations with the violent protesters. In the days and weeks following the summit, the people of Hamburg have gone out of their way to say thanks. Hotels offered free accommodation for police from other cities, museums provided free tickets to policemen and their families while stores offered them extra discounts. There was even a special concert at the new Elbphilharmonie concert hall! Today, almost a month after the summit ended, the city life has returned to normal. However, scars from the events remain. Some stores are yet to reopen, others still sport broken windows, waiting to be replaced. One thing is clear, Hamburg isn’t hosting anything like this in the foreseeable future!